He works frequently at Kitchen Theatre Company in Ithaca, New York (USA) where one year he appeared in THE WHIPPING MAN by Matthew Lopez in which he played an American slave in 1865 at the end of the Civil War, Micheal Hollinger's OPUS about a classical string quartet in which he played a cellist who is battling cancer, and BROKE-OLOGY by Nathan Louis in which he played an inner-city father dying of multiple-sclerosis. He also appeared there in Dominque Morisseau's SUNSET BABY and Gina Gionfriddo's AFTER ASHLEY. He Has amassed some impressive stage credits on the other side of the pond as well. 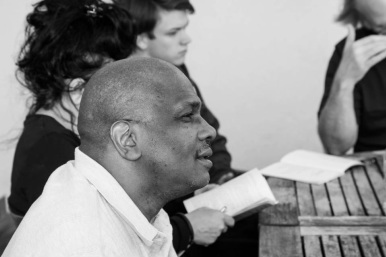 He was a cast member of Steven Berkoff's stage adaptation of ON THE WATER FRONT which ran in London´s West End at the Royal Haymarket Theatre, as well as the Edinburgh Festival, Nottingham Playhouse and the Hong Kong Arts Festival. On The Waterfront won London's “What's on Stage Award" for best Ensemble. He was seen on stage in Luxembourg City, Luxembourg, playing the role of Ross in the inaugural production by the Actors Repertory Theatre Luxembourg of Edward Albee's The Goat or Who is Sylvia? In Berlin, Germany he was seen at the English Theatre Berlin | International Performing Arts Center in UTOPIA/DYSTOPIA an evening of 10 minutes plays as well participating in their COLOR BLIND? series. 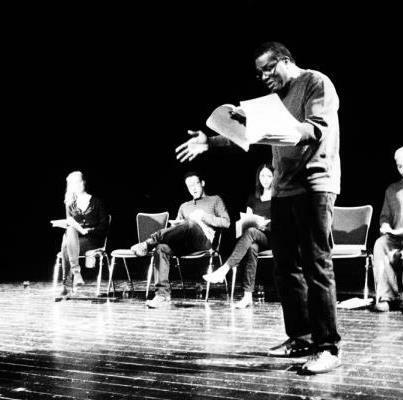 A series of staged readings emphasising the cultural diveristy of Berlin's theater scene. He also co-wrote and performed in BLACK STUFF a two-man farce about African American identity which ran at the Kitchen Theatre, Highways Performance Space (Los Angeles) and the New York Fringe Festival. He currently studies creative writing at the University of Toronto. What the critics say about Alexander's work. "Thomas – a talented veteran actor with an international résumé now based in Toronto – makes the mournful monologue into a moving play within the play." "Alexander Thomas’ portrayal of Jay’s coach and friend, Wynton was the heart of this piece for me...His storytelling ability had many audience members in tears." " (Wynton) Alexander Thomas plays him as a slow walking, slow talking man who’s worked in the fight game a long time and knows a thing or two." " Thomas tells the tale beautifully, having Wynton's suppressed anger lend the narrative incredible strength ." " Thomas' warm voice is thankfully the main narration behind fights, training, and guidance to Jay. His monologue is heartbreaking and chilling in its delivery, and gives other famous fictional coach pep-talks a real run for their money. ."
"The actor Alexander Thomas gives us Louis-Andre, a grand mix of sly negotiator, gentlemanly manners, and a generous heart.... This is one of those noteworthy characters that a gifted actor can awaken, and Alexander Thomas rises to the occasion. He both enchants and repels." "Volcanic fury, mixed with a heart bursting with love, lie concealed beneath the gentle exterior of Thomas's amazing portrayal of Kenyatta. His deft performance is so economic in its means that he simply seems to exist from one breath to the next, suffusing the play with his presence." "Alexander Thomas reveals the patience and learned calm of a man long imprisoned, with rare flashes of anger flaring through." "Thomas is also engaging and wonderfully natural as the sickened friend who is shocked by what he hears..."
"Alexander Thomas' Ross also has a transition to make: from your more-or-less traditional joking and teasing 'best friend' to someone whose tolerance flips back to 17th century Massachusetts, when faced with behaviour that he 'knows is wrong'. No flaws in a convincing performance." "Thomas gives Carl a blend of gravitas and humor that makes him seems sensible and wise, not dull or conservative." "Thomas’s genial Carl finally roused to righteous anger. (Thomas can make even a disappointing piece of cheesecake resonant.)" "Simon (the wondrous Alexander Thomas...) encounters Caleb – first taking the Confederate soldier as a looter, and then as someone sorely in need of medical assistance. In a span of a few minutes, the radical change in relationship between the men is depicted with mastery unlike anything Hollywood could conjure." "Embodied by the magnificent Alexander Thomas, William King is a man with great emotional depth, who feels as real as a next-door neighbor, coworker, or parent. " by debility — conveying his physical blunders and his extreme tenderness toward those he loves"
"Thomas' Gavin is slick and insincere, even ruthless when he needs to be. " "...a theatrical memoir by Alexander Thomas... in addition to telling his own tale, Mr. Thomas (that is, the grown-up Alex) delivers monologues in the guise of his father and all three of his brothers. And the result is a portrait of a father's poignant legacy and what struck me as a dead-on depiction of how a family diverges from a center"
"Thomas energizes every square yard of the stage, like a tennis player volleying every emotion in the text across to the audience..."
" Thomas conveys to us what it meant to be a black man in Alabama in 1933, more potently than I've ever witnessed... He tells his story with affection, humor and pride." "His multiple portraits show how intricately our individual identities are tied to family." "...watching this play isn't an academic experience; it's a pure, raw, emotional one. " "... heartfelt, riveting coming of age tale..."
"Just when we think we might have everyone "figured out," the writing takes a deft turn." "He awards his subjects humour, liveliness, and a sharp take on their circumstances. "